Neutral Concentrate is a 100% acrylic tennis court surface coating formulated for tennis courts and other sport and recreational athletic court surfaces. Neutral Concentrate is designed to be mixed with SportMaster ColorPlus pigment dispersion to achieve desired color on tennis court surface. As a color coat – .05 to .07 gallon per square yard per coat. 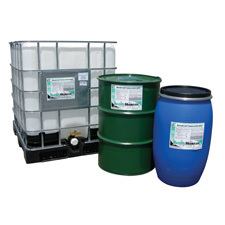 As an acrylic resurfacer with (50-60 mesh sand)- .07 to .09 gallon per square yard per coat. Neutral Concentrate is designed to be mixed with SportMaster ColorPlus pigment dispersion to achieve desired color. Neutral Concentrate is an unpigmented tennis court surface for new athletic court surfaces, and for existing tennis court resurfacing projects. Acrylic sports surfaces provide good aesthetics, spin responsive play, safe texture, and protection of the asphalt or concrete tennis court surfaces. When mixed with ColorPlus Pigment Dispersion, 16 different color coatings can be achieved with exceptional vibrance and hiding. Tennis court surfaces, basketball court surfaces, and other multipurpose athletic and game court surfaces. Pavement surface must be cleaned entirely of dust, dirt, and debris. Repair of tennis court surface defects, depressions and cracks must be completed prior to application. All repairs must be flush and smooth to adjoining surfaces. New asphalt court surfaces must cure 14 to 30 days prior to application. It is recommended that any uncoated asphalt tennis court surface receive one or more coats of Acrylic Resurfacer (Technical Bulletin CMT – 3) as required by tennis court surface roughness and porosity to provide a smooth, dense underlayment for application of color coatings in the tennis court resurfacing process. New concrete court surfaces must cure 28 days prior to application. Concrete sports surfaces should have a medium broom finish or similar roughened texture. Etch surface with muriatic or phosphoric acid and apply SportMaster Acrylic Adhesion Promoter, prior to tennis court resurfacing. (Technical Bulletin CMT – 21). Silica Sand (80 to 100 mesh) – 400 lbs. Silica Sand (50 to 60 mesh) – 600 lbs. Silica Sand (50 to 60 mesh) – 300 lbs. Note: Mix thoroughly to ensure complete dispersion of ColorPlus Pigment Dispersion, for consistent tennis court surface color. Apply mixed tennis court surface coating with a soft rubber squeegee. A minimum of two coats are recommended for consistent hiding during the tennis court resurfacing process. Stir material thoroughly before application of tennis court surface. Temperature must be a minimum of 50° F. and rising before application. Do not apply when rain is imminent or forecast. Keep from freezing. Close container when not in use . Neutral Concentrate dries in 30 to 60 minutes under optimum drying conditions. Allow each coat of material to dry thoroughly before applying successive coats. Low ambient or low tennis court surface temperature and high humidity increase drying time. Allow tennis court surface coating to cure for 48 hours after resurfacing, before opening up for play. Wash tools in water before tennis court surface material dries. Contact your SportMaster representative if you have further questions on using the Neutral Concentrate as a tennis court surface, or for additional guidance with tennis court resurfacing, tennis court construction, or repair of athletic courts. 55 gal. Pail 507 lbs. 275 gal Tote 2,875 lbs.